Also read Dachau 1945: The Souls of All Are Aflame by Douglas Cramer. April 28th: I and my fellow prisoners can hear the bombardment of Munich taking place some 30 km from our concentration camp. As the sound of artillery approaches ever nearer from the west and the north, orders are given proscribing prisoners from leaving their barracks under any circumstances. SS-soldiers patrol the camp on motorcycles as machine guns are directed at us from the watch-towers, which surround the camp. Naturally, I was ever cognizant of the fact that these momentous events were unfolding during Holy Week. But how could we mark it, other than through our silent, individual prayers? A fellow-prisoner and chief interpreter of the International prisoner’s committee, Boris F., paid a visit to my typhus-infested barrack “Block 27” to inform me that efforts were underway in conjunction with the Yugoslav and Greek National Prisoner’s Committees to arrange an Orthodox service for Easter day, May 6th. Efforts to acquire all these items from the Russian parish in Munich failed, as the Americans just could not locate anyone from that parish in the devastated city. Nevertheless, some of the problems could be solved: The approximately 400 Catholic priests detained in Dachau had been allowed to remain together in one barrack and recite mass every morning before going to work. They offered us Orthodox the use of their prayer room in “Block 26”, which was just across the road from my own “block”. The chapel was bare, save for a wooden table and a Czenstochowa icon of the Theotokos hanging on the wall above the table – an icon which had originated in Constantinople and was later brought to Belz in Galicia, where it was subsequently taken from the Orthodox by a Polish king. When the Russian Army drove Napoleon’s troops from Czenstochowa, however, the abbot of the Czenstochowa Monastery gave a copy of the icon to czar Alexander I, who placed it in the Kazan Cathedral in Saint-Petersburg where it was venerated until the Bolshevik seizure of power. A creative solution to the problem of the vestments was also found. New linen towels were taken from the hospital of our former SS-guards. When sewn together lengthwise, two towels formed an epitrachilion and when sewn together at the ends they became an orarion. Red crosses, originally intended to be worn by the medical personnel of the SS-guards, were put on the towel-vestments. On Easter Sunday, May 6th (April 23rd according to the Church calendar), – which ominously fell that year on Saint George the Victory-Bearer’s Day, Serbs, Greeks and Russians gathered at the Catholic Priests barrack. Although Russians comprised about 40 percent of the Dachau inmates, only a few managed to attend the service. By that time “repatriation officers” of the special “Smersh” units had arrived in Dachau by American military planes, and begun the process of erecting new lines of barbed wire for the purpose of isolating Soviet citizens from the rest of the prisoners, which was the first step in preparing them for their eventual forced repatriation. In the entire history of the Orthodox Church there has probably never been an Easter service like the one at Dachau in 1945. Greek and Serbian priests together with a Serbian deacon adorned the make-shift “vestments” over their blue and gray-striped prisoners uniforms. Then they began to chant, changing from Greek to Slavonic, and then back again to Greek. The Easter Canon, the Easter Sticheras – everything was recited from memory. The Gospel – “In the beginning was the Word” – also from memory. And finally, the Homily of Saint John Chrysostom – also from memory. A young Greek monk from the Holy Mountain stood up in front of us and recited it with such infectious enthusiasm that we shall never forget him as long as we live. Saint John Chrysostomos himself seemed to speak through him to us and to the rest of the world as well! Eighteen Orthodox priests and one deacon – most of whom were Serbs, participated in this unforgettable service. Like the sick man who had been lowered through the roof of a house and placed in front of the feet of Christ the Saviour, the Greek Archimandrite Meletios was carried on a stretcher into the chapel, where he remained prostrate for the duration of the service. 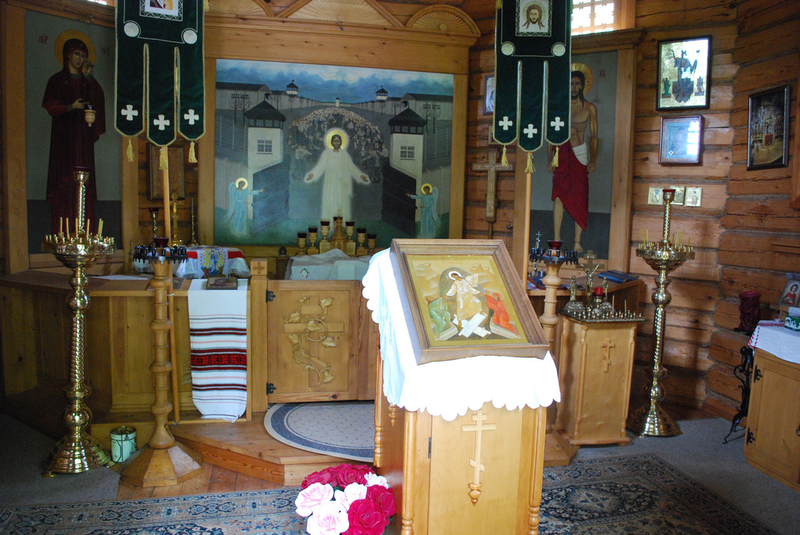 The priests who participated in the 1945 Dachau Easter service are commemorated at every Divine Service held in the Dachau Russian Orthodox Memorial Chapel, along with all Orthodox Christians, who lost their lives “at this place, or at another place of torture” (“na meste sem i v inykh mestakh mucheniya umuchennykh i ubiennykh”).The Dachau Resurrection-Chapel, which was constructed by a unit of the Russian Army’s Western Group of Forces just before their departure from Germany in August, 1994, is an exact replica of a North-Russian “tent-domed” (Shatrovyie) church or chapel. Behind the altar-table of the chapel is a large icon depicting angels opening the gates of the Dachau concentration camp and Christ Himself leading the prisoners to freedom. Today I would like to take the opportunity to ask you, Orthodox Christians all over the world, to pass on the names of fellow Orthodox who were imprisoned and died here in Dachau or in other Nazi concentration camps so that we can include them in our prayers. Should you ever come to Germany, be sure to visit our Russian Chapel on the site of the former concentration camp in Dachau and pray for all those who died “at this place, or at another place of torture”.